Ribbon diagram depicting the average main chain conformation of 20 NMR-derived structures of a complex between yeast frequenin (Frq1), a small Ca2+-binding regulatory protein, and a peptide representing its binding site (residues 121-174) in its target enzyme, a phosphatidylinositol 4-kinase isoform (Pik1), viewed from the binding interface (PDB accession no. 2JU0). Helices in Pik1(121-174) connected by an unstructured loop are colored magenta and the four EF-hands (EF1, EF2, EF3 and EF4) in Frq1 are highlighted in green, salmon, cyan, and yellow, respectively, but only EF2, EF3 and EF4 are competent to bind a calcium ion (orange sphere). 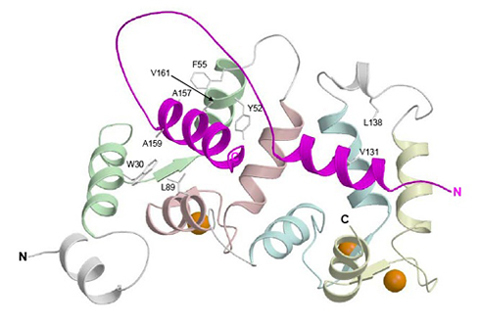 For details, see: Strahl T, Huttner IG, Lusin JD, Osawa M, King D, Thorner J, Ames JB (2007) Structural insights into activation of phosphatidylinositol 4-kinase (Pik1) by yeast frequenin (Frq1). J. Biol. Chem. 24 Aug 2007.